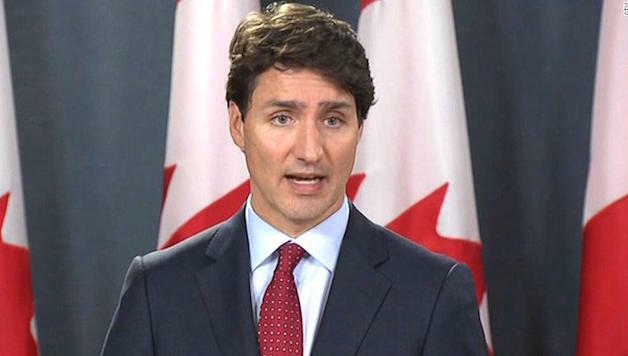 Canada’s Prime Minister, Justin Trudeau, capitulated to oil pipe company Kinder Morgan’s blackmail. Texas-based Kinder Morgan wanted to expand a pipeline by an extra 1,000km, from Alberta’s oil sands to the Pacific coast. But Kinder Morgan suspended all “non-essential spending” on the pipeline due to the “extraordinary political risks.” It set a deadline of May 31st for the federal government to provide guaranteed “clarity on the path forward,” or it threatened to cancel the project. Canada’s Liberal government has announced that it will buy Kinder Morgan’s existing pipeline, which runs from Alberta’s tar sands to the port of Vancouver, for $4.5 billion. It is now “Trudeau’s pipeline”. It will be up to his government to try to force through the pipeline expansion against mass resistance. This decision to spend taxpayer money on a dodgy project is in response to Kinder Morgan’s threat, issued on 8 April, that it was suspending all “non-essential spending” on expanding the pipeline because of claimed “extraordinary political risks.” It demanded that the federal government provide guaranteed “clarity on the path forward,” by 31 May, or it might cancel the project. The purchase removes all risk from Kinder Morgan (KM) and transfers it to Canadians. However, it does not resolve any of the many obstacles to the tripling of the pipeline’s capacity. The mass resistance of First Nations and the public in British Columbia (BC) still remains. Within hours of the announcement of the purchase, thousands demonstrated in Vancouver. As the Royal Bank of Canada valued the existing pipeline at $2.3 billion, the shareholders at KM, a Texas-based company that emerged from the wreckage of Enron, are laughing at Canada all the way to the bank. What are these risks that are blocking the proposed pipeline? Kinder Morgan is not referring to the impact of the pipeline on climate change or the huge threat it poses to BC’s environment and jobs. The risks that they are concerned with are the many opponents of the expansion. BC’s government has a legal case seeking to block any increase in diluted bitumen shipments through BC waters, due to safety concerns. More significantly, there are several outstanding court cases from First Nations objecting to the approval process. The Canadian government has a legal duty to consult with First Nations over the pipeline. The Supreme Court of Canada, in 2014 found that “the Crown is obliged to consult with the group asserting Aboriginal title and, if appropriate, accommodate the Aboriginal right.” Many First Nations state they were not consulted in the flawed process that approved the pipeline under the previous Canadian government led by Stephen Harper. The pipeline would pass through the traditional territories of First Nations staunchly opposed to it. The Tsleil-Waututh and Squamish territories are at the pipeline’s terminal and almost half the pipeline’s route passes through Secwepemc territory. They have plans to block construction. In addition is the resistance of people, especially in Vancouver. Over 200 people, including two Members of Parliament, have already been arrested for peaceful standing outside KM’s gates, charged with contempt of court. Many thousands more are committed to doing so. The Alberta government has passed legislation allowing it to cut off the supply of oil and gas to BC. This is being challenged in court by the BC government. None of these obstacles are overcome by the government’s purchase of the pipeline. The many court cases will drag on for months or more and the people’s resistance will remain. The pipeline battle will intensify before it is resolved. Rick Orman, a former Alberta cabinet member, has stated that the army will be needed to build the pipeline. Others have talked of using the War Measures Act. With this approach, the allegedly progressive Prime Minister Justin Trudeau could be heading for a bitter conflict similar to the one that took place at Standing Rock. Trudeau made a big splash at the Paris Climate Change conference in 2015, promising to reduce Canada’s CO2 releases. Already the tar sands are Canada’s biggest source of CO2 emissions. The pipeline would increase disastrous global climate change already wreaking havoc in Canada and around the world with record high temperatures, and an increase in fires, floods and droughts. Pipelines leak all the time – KM’s existing BC pipeline leaked two days before the announcement of the purchase. The proposed route will cross some 500 rivers and streams and a leak would threaten communities’ water supplies and damage fishing and other wildlife. A leak in Vancouver harbour would be a disaster. The Exxon Valdez spill of 260,000 barrels of oil contaminated 2,000 kilometres of coastline and the incomplete clean-up cost over US$6 billion in today’s money. The tankers that the proposed pipeline would fill are twice as big as the Exxon Valdez leak and diluted bitumen is far harder to clean up than crude oil. Yet Canadian law only requires a pipeline company to have $1billion to cover spill liabilities. A tanker owner’s liability is also limited, to just $1.36 billion – both woefully inadequate. On top of the cost of clean-up, is the impact on jobs. A spill in the harbour would cost thousands of jobs in fishing, tourism, recreation, transportation in the port and on the railways, and other sectors. Research by CRED estimates that 200,000 jobs in BC are at risk from a major oil spill. Why, given the known damage the pipeline will do to climate change and the high likelihood of damage to BC’s environment and employment, does anyone want to build this pipeline? Even more baffling, why does the government want to own this pipeline? Trudeau claims the pipeline is in the “national interest.” He justifies this with talk of 15,000 jobs. This figure is false; there is no basis for the claim. It is true there will be short-term construction jobs, of around probably 2,500 for two years. Once completed, according to KM’s own figures, there will be only 90 full time jobs (50 in BC and 40 in Alberta). Trudeau’s “national interest,” is the interests of the oil industry. It ignores the environment and climate change, and does not provide good long-term jobs. It is the total opposite of his election pledges to respect First Nations and protect the environment. There is also a claim that the pipeline will result in higher prices for Alberta’s bitumen, which sells at a lower price in the US than normal crude. However the differential is due to the higher cost of refining bitumen and the cost of moving the bitumen from Alberta to the refineries. Trudeau’s pipeline will do nothing about either of these. The claimed target market for the pipeline to Vancouver is East Asia, so there would be additional costs of shipping it across the Pacific Ocean. With approval of two other pipelines from the tar sands, Keystone XL to the Gulf of Mexico and Enbridge’s Line 3 to Lake Superior, the economic foundation of Trudeau’s pipeline are weak. Political scientist Hamish Telford states that “the business case for the project has deteriorated to the point where Kinder Morgan was no longer willing to assume the risk for it.” It is a myth that the pipeline to Vancouver will bring back the boom to Alberta’s oil industry. The tar sands industry is shedding thousands of jobs as technology replaces workers. Suncor, one of the big tar sands companies, has just announced it is cutting 400 jobs, replacing truck drivers with automated trucks. Unifor, the largest union in the oil sands, is opposed to the Kinder Morgan pipeline. Joie Warnock, Unifor’s Western Director, is clear, “There is truly no shortage of reasons to reject this pipeline proposal. We stand with First Nations and environmental organizations who have made compelling cases against the pipeline.” Among the reasons for Unifor’s opposition are the risks to BC’s fishing industry, as “the commercial fishery [would be] at risk of a catastrophic spill,” fear of job losses and the export of jobs. The existing refinery in Vancouver relies on regular crude oil from Alberta. When the pipeline switches to dilute bitumen it will be unable to refine it. The Alberta Federation of Labour was also critical of the pipeline as it would export raw bitumen to refineries and factories in other countries, thus exporting jobs and most of the value-added in processing. It is more likely that the pipeline will destroy jobs after an inevitable leak or spill. The pipeline will boost climate change, costing billions of dollars in fires, floods and other disasters. The jobs this pipeline will really create are firefighters, emergency responders and dyke builders. Tragically, the Alberta’s New Democratic government has drunk the tar sand industry’s propaganda kool-aid that the pipeline will provide permanent jobs. When they won the 2015 election, they promised to diversify the economy from its reliance on oil and gas. Their platform stated, “we’ll reduce our province’s over-dependence on raw bitumen exports and create more jobs with more upgrading and processing here, rather than in Texas.” The vast majority of Albertans, a stunning 79%, think Alberta is too dependent on oil and gas. Yet the government is now acting like paid representatives of Kinder Morgan, offering $2 billion to help build Trudeau’s pipeline, as it fights hard to boost the export of raw bitumen. This battle is heading to the courts and possibly a constitutional crisis. Québec’s politicians, ever sensitive to defending Québec’s rights within Canada, are unhappy with Trudeau’s actions. In April, the Premier warned the federal government to be “very careful,” viewing its desire to overrule BC’s concerns as “not a good sign for federalism.” After the purchase, other politicians have expressed even stronger opposition. Trudeau’s image regarding the environment and First Nations is ruined. But as Canada’s elite depend on extracting and exporting raw materials, Trudeau’s has to show global capitalism that Canada is open for exploitation. Trudeau, as with the previous Liberal governments, remains loyal to big business. Trudeau’s purchase of the pipeline has raised the stakes. He will not be moved by petitions, postcards, demonstrations or mass arrests. As an oil spill in the harbour would threaten thousands of jobs and close the port for weeks, Socialist Alternative is campaigning for a one-day shutdown of Vancouver to hit Trudeau’s rich backers. If the BC federation of Labour, the Union of BC Indian Chiefs and elected representatives all called for a strike of workplaces schools and universities, along with a mass rally, it a big step towards stopping Trudeau’s pipeline. Canada’s fossil fuel industry receives $3 billion of annual subsidies. The government is spending $4.5 billion to buy the existing pipeline and construction costs for the expansion are at least $7.4 billion. If this $15 billion was used to replace fossil fuels with clean energy and upgrade buildings, there would be far more good jobs, while respecting Indigenous rights and protecting the environment. Previous articlePittsburgh Renters Fight Back: Build Affordable Housing Now!